You have probably heard the beautiful sound of the steelpan at some point during your stay in Barbados; perhaps drifting through a restaurant or even on your arrival at the airport. Though the steelpan originated in Trinidad and Tobago, it has grown to become recognised as a Caribbean symbol around the world thanks to its cheerful melody. Pan on the sand is an important event on the Crop Over Calendar, with large Barbadian and Trinidadian groups performing together on the beach. This event is great for the entire family. Food and drink will be available to purchase. The Junior Kadooment (Also known as ‘Kiddies Kadooment’) is a smaller, younger version of the Grand Kadooment and without the street parade. 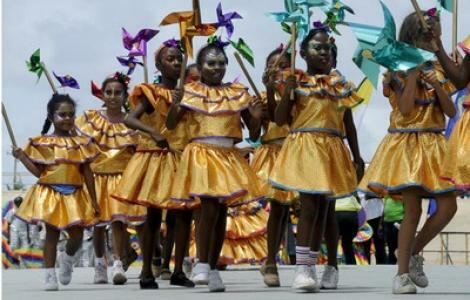 Barbadian children dress in beautiful costumes and compete for titles and prizes as part of different ‘bands’ or groups within the stadium compound. There are several categories in which they can enter, such as Craftsmanship and visual impact, so you are guaranteed an incredible display! All are welcome to watch the festivities from the stadium seats, make sure to bring your camera! Food and drink are on sale. The biggest street fair of the year takes place the weekend before the Grand Kadooment on the Spring Garden Highway, which is closed off for the occasion. The Market features a variety of local art, crafts, food and drink from colourful stalls on the side of the road. The atmosphere is very lively thanks to a wide range of local music such as folk groups (look out for a funny character called Mother Sally!) dance and gospel groups and calypso and reggae. Locals descend on the food stalls to ‘lime’ (hang out) and fill up on rum, beer and Bajan delicacies. Children will love being a part of the action! Food and drink will be available to purchase. On the Friday before the Grand Kadooment, Barbadians cover themselves with paint, mud & chocolate and party through the streets in a night-time street party with a parade of organised bands of revellers. J'ouvert is a contraction of the French ‘jour ouvert’, or ‘dawn/day break’ and this is why the party starts early in the morning (around 2am) and continues until around 9am. A key factor in the planning of the event is the safety and security of the revellers and the spectators, and as such the route through Bridgetown is well lit, the music trucks are fitted with lights and private security is deployed with each group. Foreday Morning bands offer packages for a fee, which include drinks & entertainment, mud & paint, plus more extras depending on the band of choice. Mix Nutz is a recommended j'ouvert band that you can purchase tickets from to partake in the festivities. Please note that this event is for adults only. "Kadooment Day" is the official finale celebration of the Crop Over Festival Season, usually held on the first Monday of August. This parade of Masquerade Bands, party through the streets before judges in a Carnival-like fashion to be judged at strategic points, wearing elaborate feathered, beaded and sequined costumes. The street party ends at the beach-front Spring Garden Highway. You can watch the festivities from various vantage points, including the National Stadium, the Spring Garden Highway and even from a boat moored in Browne’s Beach. This is a family affair, and children are sometimes given feathered pieces of the costumes by revellers passing by! Location: Starting at the National Stadium and ending on Spring Garden Highway. Good vantage points include the National Stadium, the Barbados Kennel Club and Spring Garden Highway. Time: Between 7am - 7pm, depending on the bands. It is suggested that you shelter in the shade when watching the parade, or to go earlier in the morning or later in the afternoon.